Ceramic-matrix composites (CMCs) as a subset of composites and ceramics have emerged as a vastly promising area for a wide array of light-weight applications displaying a spectrum of unique properties. For long, these composites have been a material of choice in the aviation industry used for making light-weight structural materials, notably efficient jet engines. Properties such as remarkably high thermal and chemical resistance, coupled with the amazing mechanical strength the class of materials has, have led to their rapid commercialization in the aerospace and defense industry. The marked thermal shock resistance and damage tolerance CMCs has led to their burgeoning application in making structures that are subject to extreme hot conditions, such as in internal engine components. Advances in fabrication processes and relentless research into discovering cost-effective manufacturing technologies are expanding the potential of the market. Constant stride being made in material sciences will pave way for a shift in CMCs being used from high-end applications to mainstream ones. Manufacturers world over are engaged in developing less energy-intensive conversion procedures, which is expected to bring down the cost of finished products, fueling their commercialization. Furthermore, rise in investment for facilitating the manufacturing of CMCs at scale will open lucrative avenues in the market. The global ceramic matrix composites market is projected to expand at a promising CAGR of 8.1% from 2017 to 2026. Vis-à-vis revenues generated from the global sales, the ceramic matrix composites market is anticipated to cross a valuation of US$ 6,500 million by the end of this period. Based on product type, the ceramic matrix composites market is segmented into carbon/carbon, SiC/SiC, oxides/oxides, and other types. Of these, the SiC/SiC is expected to account for the leading share in the global market over the forecast period. This can be attributed to the property of oxidation resistance higher than all others. However, the high cost required upfront for development processes of SiC CMC and several other expenses pertaining to their transportation and usage are crucial aspects expected to subdue the demand in the coming years. On account of these downsides, various end-use industries are increasingly led to prefer CMC oxides. 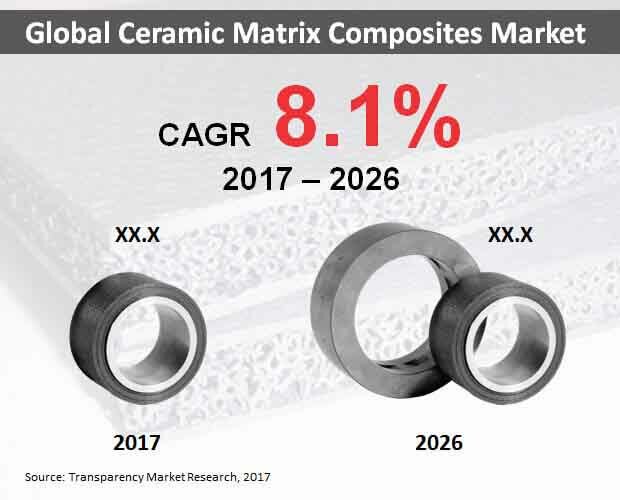 Meanwhile, carbon ceramic matrix composites is prognosticated to witness the highest growth, vis-à-vis their global sales, through 2026. The widespread uptake in making braking structural components for luxury vehicles and aircrafts is a notable factor stoking its growth. The various end-use industries comprise aerospace and defense, automotive, energy and power, electrical and electronics, apart from the others segment. Of these, industries such as energy and power and electrical and electronics are expected to serve the dominant demand for CMCs. The remarkable thermal stability and amazing thermal conductivity CMCs exhibit make them preferable for making structural components in these end-use industries. These end-use industries will clock the leading CAGR over the assessment period. On the other hand, industries such as automotive, aerospace, and defense, are proving to be highly lucrative for the sales of CMCs. The proliferating demand of CMCs in these end-use industries is attributed to the salient properties of exceptional load resistance, high shock resistance, and enhanced flexibility. The key regional segments comprise North America, Europe, Latin America, Japan, Asia Pacific excluding Japan (APEJ), and the Middle East and Africa (MEA). Of these, the APEJ market is expected to lead the pack, vis-à-vis sales growth, through the assessment period. Substantial and continued advancements made in the aerospace manufacturing and the burgeoning demand for energy in various countries will push the region to the forefront. The presence of low-cost, labor-surplus economies such as India, Malaysia, Thailand, and China is a crucial aspect accounting for the lucrativeness of the region.